I have no love lost for rats, I have no special turn-ons for chefs, and don't much care for Paris. On the other hand, before I went ahead and watched Ratatouille (pronounced rat-a-too-ee, if you didn't know), I knew I would be in for a treat. It's Pixar, the people who give us something original and fresh every year instead of regurgitating fairy tale pastiches, and it's half directed by Brad Bird, the man who made The Incredibles (which was pretty incredible), and my favorite animation film of all time, Iron Giant. Needless to say I had my expectations high for a film on things I didn't care about at all. I know, crazy talk, right? Yeah, well, this is a film where a rat becomes the master chef of Paris. Welcome to crazy town. To be honest I didn't think it was a great idea to begin with, but somewhere down the road, the film lifts itself up from its one note premise, and becomes a funny caper about the volatility of an artist spurned. This one, if you look closely, is not just for your kids. A rat clan lives in a colony in an attic in the French countryside. Father Django (Brian Dennehy) is not so thrilled that son Remy (Patton Oswalt) wants to be a chef, cooking human foodstuffs and what not. A crazy and thrilling ride of a mishap later, Remy finds himself in Paris, the city of the restaurant owned by his idol, Chef Auguste Gusteau (Brad Garrett), who says, "Anyone can cook". Gusteau, though, is only present in spirit (literally), having passed away recently, and his restaurant is run by a manic called Skinner (Ian Holm, clearly having the biggest ball), interested more in using Gusteau's name as brand than keeping the restaurant the best in business. Enter Remy, who can cook, but can't speak human, and from the rear, a gangly young lad named Linguini (Lou Romano), who can speak alright, but hoo boy, can't cook. Part of the Pixar magic of course is the various side characters they conjure up, and so it is here. Apart from Remy, Linguini and Skinner, the kitchen is full of interesting characters and a whole host of activity which (at ALL times) feels real and functioning, and I swear I could smell the spices. So we have Collette (Janeane Garofalo), a female chef, working doubly hard to make it in the male-dominated profession she is in, and also the brooding snob of a food critic Anton Ego (Peter O'Toole). If you have seen the trailer, you know that the boy and the rat meet, hook up, and while the rat pulls the strings (hair, actually) the boy becomes a master chef. But the incredible emotional journey that the director takes them through is not even hinted at in the previews. Trust me, there is a lot more than meets the eye. The two buddies have differences, fight, explore their emotions, and finally make a stand that will have you eating out of their hands. Heh heh! The animation is soft, multihued, and drop-dead gorgeous. The dialog is fresh and crisp, and the screenplay has a sparkle and wit not seen in any movie made for kids since... well, since The Incredibles. The only complaint really is the voice acting. Don't get me wrong, Patton Oswalt is fun, but he lacks the verve that characterizes Pixar heroes. The rest of the cast, too, is more interested in voicing the characters than going anywhere with the characters they inhabit. Pity, because the sound design is absolutely incredible. Actually, technically, or artistically, it is hard to find fault with this film. This is solely because of Brad Bird, the man who simply does not bow down to any audience cliché. There are no moments here that serve the children, teens or adults specifically, like a whole host of animation films tend to do. This is out-and-out an intelligent narrative told with confidence in the audience's taste in appreciating a good dish when served. The story may be one told earlier, but he infuses soul into his telling, and that counts in my book. Ratatouille may be far from perfect, but is amazingly smart, witty, and surprisingly incisive. The film is required watching for anyone who appreciates a fulfilling, if slightly shopworn, story, told well and with heart. This is not a shock and awe animation film out to give cheap potty jokes, some rock songs and a wisecracking animal to make as much money as it can. This is a film that sets out to take you on a journey, and won't be satisfied until you go along with the ride. 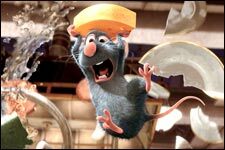 Be the first to comment on Ratatouille! Just use the simple form below. fullhyd.com has 700,000+ monthly visits. Tell Hyderabad what you feel about Ratatouille!